Here’s a great new series of prints being launched for International Women’s Day celebrating Scottish political women by Lorna Miller, available as signed Giclee Prints. I suspect all three would back the Global Women’s Strike. 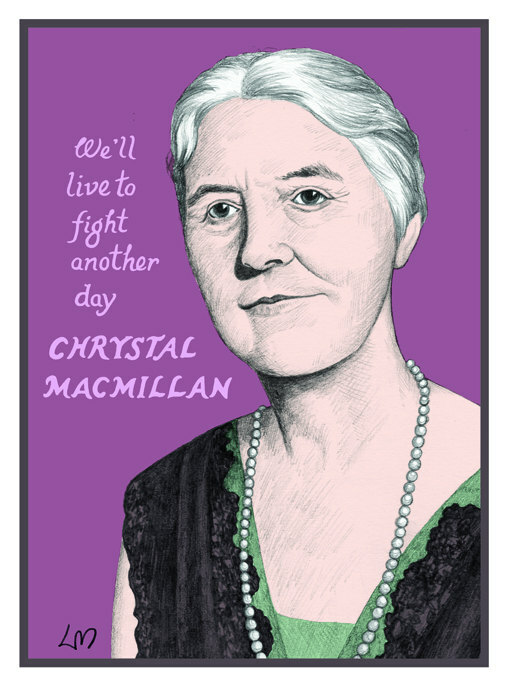 Chrystal Macmillan (1872-1937) was a barrister and campaigner for women’s rights from Edinburgh. She appeared before a number of committees and enquiries promoting the interests of women on issues such as street crime and equal rights on unemployment insurance. She was born in Edinburgh in 1872, and was the only daughter of nine children. She was one of the first women to be admitted to a university course in Scotland. She campaigned all her life for a woman’s right to full citizenship under the law, in Scotland, Great Britain and internationally. She became secretary of the International Woman Suffrage Alliance in 1913. Between 1900 and 1913 she worked for the Scottish Federation of Women’s Suffrage Societies and campaigned throughout Scotland. She spoke at public meetings and encouraged women to find their own voices and to organise themselves locally. She is remembered by a series of annual lectures which ‘aim to focus public engagement with key themes of social justice including human rights, gender and equality, peace and conflict resolution, and global citizenship’ – hosted by the The School of Social and Political Science at the University of Edinburgh. See previous here. During the First World War she helped organise the International Congress of Women in the Hague, which sought the intervention of neutral states to bring an end to the war. Order your print here. 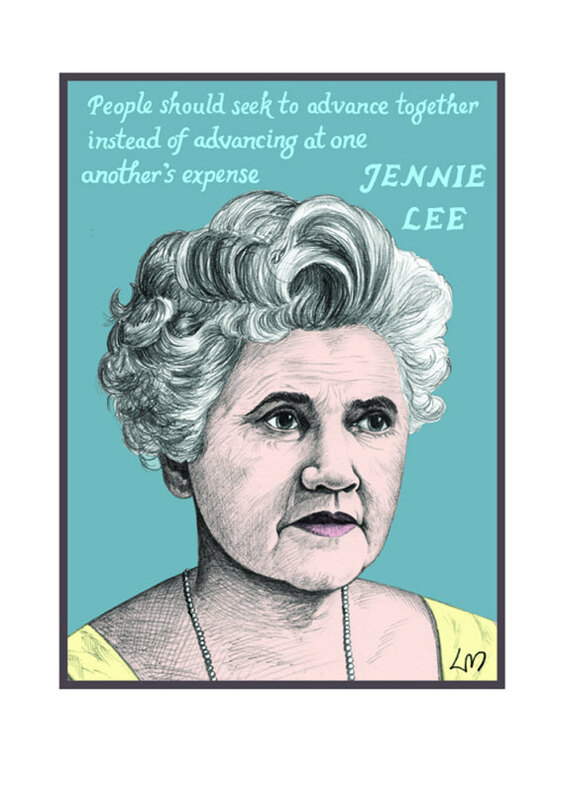 Jennie Lee (1904-1988) was a socialist and a Labour Party politician from Fife. She was born in Lochgelly – and became the youngest woman to be elected to the House of Commons (at just 24) when she won the 1929 by-election in Cowdenbeath, standing as the Independent Labour Party candidate. Becoming the youngest member in the House of Commons was an astonishing accomplishment for any politician, but for it to be done by a woman in 1929 made it all the more remarkable. She left the ILP to move to the Labour Party in 1945 and was elected as Labour candidate for the Cannock constituency in Staffordshire. After the 1964 General Election she was appointed Minister for the Arts, producing the seminal White Paper ‘A Policy for the Arts’. In 1967 Lee laid the foundations for the ‘University of the Air’, or Open University. Launched two years later, it provided a distance learning platform via television programmes transmitted by the BBC. Initially with 25,000 places, by 1984 it was Britain’s largest university with 100,000 students. In 1970 Lee took a Life Peerage, becoming Baroness Lee of Asheridge. She was appointed arts minister in 1964 and played a central role in the establishment of the Open University. Order your print here. 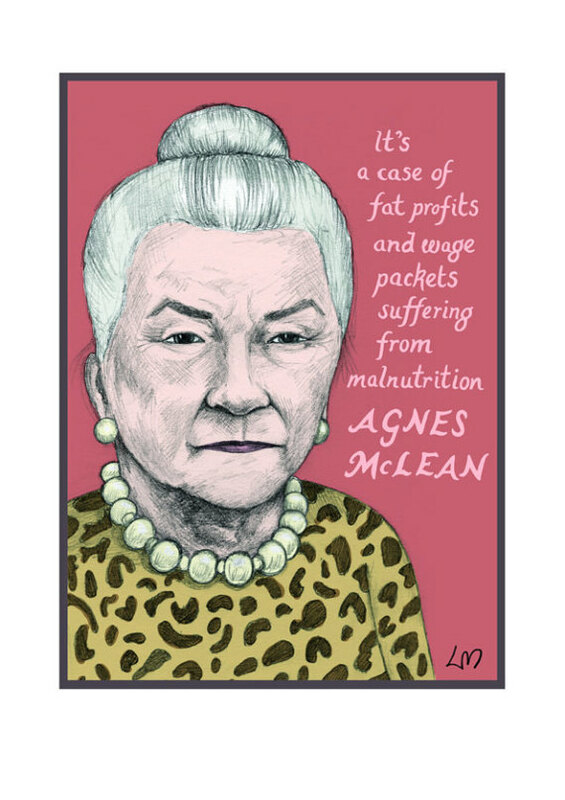 Agnes McLean (1918-1994) was a socialist activist for workers’ rights and Councillor from Glasgow. She was the first women shop steward at the Rolls-Royce aero-engine factory in Hillington, Renfrewshire. Born in the Kinning Park district of Glasgow in 1918, McLean initially worked as a bookbinder before getting a job at the Rolls Royce plant on the outskirts of Glasgow in late 1939. McLean’s generation grew up in the shadow of “Red Clydeside”. Her father was a member of John MacLean’s Scottish Workers’ Republican Party. As a child she attended a Proletarian Sunday School and then a Socialist Sunday School. She worked on the shop floor in engineering component manufacturing for the war with 10,000 other women. She led the women out on strike for equal pay in 1943, supported by the male workers. This move led to actions for equal pay across the UK. She loved to dance and in 1993 she visited Cuba to trace the origins of the rumba for the BAFTA Scotland award-winning BBC programme, In Cuba They’re Still Dancing by Barbara Orton. Order your print here. This looks like the start of a good series! Can I point out a wee geographical error in Jennie Lee’s biog? I don’t think Cowdenbeath got moved to North Lanarkshire at any time! The confusion is probably that she was a teacher in Cowdenbeath prior to being elected an MP for North Lanarkshire in that by-election! If Lorna Miller is looking for other subjects for this series, can I suggest Helen Crawfurd? Suffragette, rent strike campaigner, peace activist, and founding member of the Communist Party alongside Wille Gallacher. Mary Barbour, I’m sure she knows about already. Re Agnes MacLean, I remember about 40 years ago being interviewed for a job with Glasgow Corporation. The interview panel was chaired by the redoubtable Ms MacLean. There were several bombastic and pretentious men on the interview panel – one asked me a question in ancient Greek! – but Ms MacLean was unfazed by their pomposity and put their gas at a peep. The image that has remained with me was that when she was seated, her feet did not reach the floor! Wee she might have been but there was a Titan in that frame. Sadly, Scottish Labour does not have such people, who knew clearly whose side they were on and what they were fighting for. Thanks for the great wee story about Agnes Alasdair! Nice comic strip, Lorna! She was an amazing woman – arrested in 1914 for defending Emmeline Pankhurst from the police who were trying to arrest her at a public meeting in Glasgow, she went on hunger strike. She stood for the CPGB on many occasions, never coming close to election, until she retired to Dunoon when she was elected as a town councillor! I also remember Agnes McLean very well as a Strathclyde Regional Councillor, and as the star of In Cuba, They’re Still Dancing – which if I remember correctly, was supported financially by Nalgo Scotland (where I was chair of publicity). (Nalgo merged with Cohse, and Nupe in 1993).